Asparagus wrapped in Prosciutto, Thyme for Cooking spring gourmet starter. Asparagus that is a bit thicker than a pen is perfect, but any will work. Lay the spears at an angle on the Prosciutto to roll and place seam side down on the baking sheet. It you don't have a nonstick baking sheet, brush lightly with oil first. Snap off stem ends of asparagus. If white, use vegetable peeler and peel bottom half of stalk. Heat water in a skillet large enough to hold the asparagus flat. The water should just be just deep enough to cover the asparagus. When it's boiling, add the asparagus and blanch for 2 minutes. Remove and rinse in cold water until cool. Cut Prosciutto in half the long way. 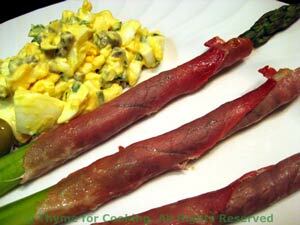 Wrap each asparagus spear in a half-slice of Prosciutto, starting just below the tip. Lay the wrapped asparagus on a baking sheet, and bake, 400F (200C) until the Prosciutto starts to look crisp, 10 - 12 minutes. Garnish with egg salad and serve. When eggs are cooked, cool and peel. Chop eggs and put into a small bowl. Add capers, mayonnaise, mustard and vinegar.